New Traveling Card: A card is signed and subsequently lost in the deck. 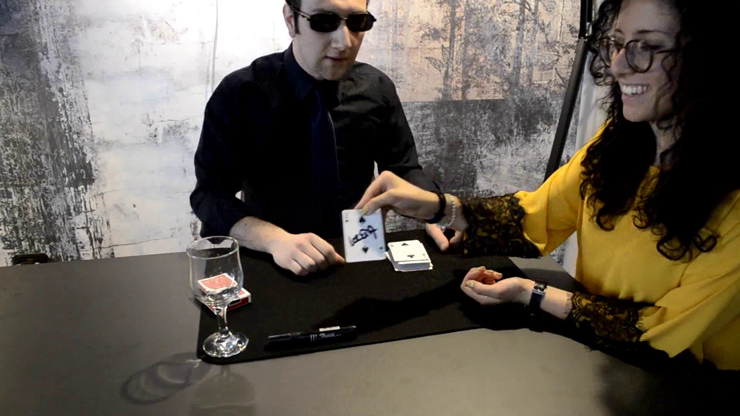 The magician removes four cards and shows them to the spectator - none of the four is the signed card. They are placed in a drinking glass on display. The spectator deals the remaining cards from the deck - their card has vanished. The magician removes the cards from the glass, and now FIVE cards are inside the glass -- one has clearly traveled from the deck. The card in the middle is of the five is revealed to be the signed card! No glue, no stick, no magnet, no thread. Pure magic! Mental Interception: Want to convince someone that you are a mind reader? This effect should do that for you! A sheet is removed from a pad of paper. The magician draws a box on the paper, and the spectator is invited to write anything inside the box that they would like -- a freely thought-of word or drawing. The magician places the sheet back into the pad so it cannot be seen. To be extra sure that the magician cannot see it, the pad is placed into a black, opaque bag. This is then placed into a drinking glass. The magician concentrates deeply, and using a second, larger pad, the magician exactly duplicates what the spectator wrote moments before! The spectator, by the way, watches the magician's drawing take place from a blank sheet to the revelation. Amazing!